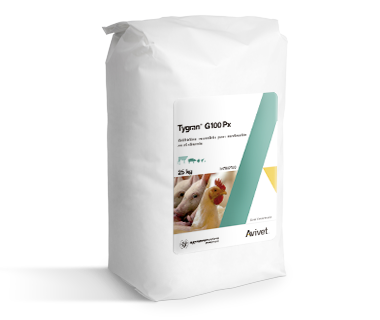 Tygran® G100 Px is an antibiotic product for the medication of poultry and swine food. It provides 100 mg / g of tylosin and is very effective against different diseases important in pigs and poultry. It acts against Gram + microorganisms and some Gram - and offers a good antimycoplasmic activity. Poultry: Chronic respiratory disease (CKD), mycoplasmosis, aerosaculitis, infectious sinusitis. Swine: Mycoplasmal pneumonia, swine dysentery, proliferative enteropathy (PPE) or ileitis. Poultry: 8 – 10 kg/ MT of food (CRDs: 2 – 5 kg/ MT of food). Swine: 400 g – 1 kg/ MT of food. Avivet © is a division of Agrovet Market S.A.